Henry Howland was born in Conway, Massachusetts on March 29, 1827. In 1854, he moved to Chicago and became engaged in the lumber business. He married Jane Eliza Gray on August 12, 1856. The 1860 census lists Howland's occupation as "commission merchant". The Howland's were living in Chicago's Fifth Ward. They had a son Allin, age 2 (born December 17, 1857), and a newborn daughter, Grace (born April 19, 1860). Captain Henry Howland, Assistant Quartermaster [of Palmer's Brigade] is a native of Conway, Massachusetts, where his parents now reside. In October, 1852, he removed to Chicago, Illinois, and for several years was extensively engaged in the lumber-trade in that city. 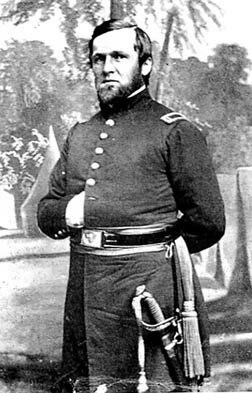 He was commissioned as quartermaster of the 51st Illinois Infantry, September 20, 1861, and left Chicago with his regiment on the 14th of February, 1862. On the 4th of March the regiment was ordered to join the Army of the Mississippi, then under the command of General Pope; and Quartermaster Howland was left at Cairo to attend to the transportation of the regiment. Rejoining it at New Madrid, Missouri, on the 13th of March, he was the same day detailed by General E. A. Paine, commanding the 1st Division, as quartermaster of the division. He acted as aide to General Paine in the Battle of Farmington, May 8 and 9, 1862. On the 9th of June, 1862 he was appointed by the President assistant quartermaster, with the rank of captain and remained with the old 1st Division of the Army of the Mississippi until December 10, 1862, when, by order of General Rosecrans, he was transferred to the old 4th Division of the Army of the Ohio, now the 2d Division of the 21st Army Corps. In April 1862, as the Fifty-First Illinois steamed along the rivers, after New Madrid and Island No. 10, to Pittsburg and Hamburg Landings, Howland wrote this letter to his family. In 1862, that country was full of cotton and everybody wanted some of it... We had no entrenching tools, so I had a few hundred bales of cotton hauled in from neighboring plantations and fortified with that. We repaired the railroad from Corinth to Decatur, so we had rail connection with the north... One day a St. Louis gentleman came down on the train from Corinth with a Treasury permit to buy cotton, and plenty of money to pay for it. He showed me his papers, and I told him he was all right, the country was full of cotton, and he could get all he wanted of it. But, he said, I can't handle cotton without teams, and from what I can learn you have the only teams in the country. This was true, so, after talking with my quartermaster, we decided to let his train haul in cotton for the St. Louis man, charging a good round price per bale, and good extra duty pay for the men. The sum charged for hauling went into the Hospital fund. the cotton buyer got all the stuff he wanted, paying for it fairly. It was shipped north on the cars, and he went off happy. My quartermaster was a shrewd Chicago lumberman, and I found out afterward that the St. Louis man told him that, if he got his cotton through safely, he should give him a certain per centage of his profits, and he did, afterward, deposit to the credit of Capt. Howland in a St. Louis bank, the sum of $10,500. Howland's career separated him from the Fifty-First Illinois in terms of chain of command; for a while he servred in the Twenty-First Army Corps (as second division quartermaster) of the Army of the Cumberland while the Fifty-First was in the Fourth Corps, but in late 1863 Howland transitioned to the Fourth Corps. Howland served on with the Army of the Cumberland. In February 1864, Major General John M. Palmer, in February 1864, wiped Sherman's dust from his feet and eventually moved on to head the new Department of Kentucky. In 1865, Howland followed Palmer as his quartermaster and was promoted to the rank of lieutenant-colonel in May 1865. Howland's military service continued until January 19, 1867. While in Kentucky, Howland and Jane Eliza had another son, George, born November 19, 1865. Post-War: I labor for home, happiness, and Heaven. After mustering out of the army, Howland returned to Chicago and again took up the lumber business. His business ambitions took him to Leadville, Colorado in the 1870s to pursue mining interests. The mining plans dematerialized, as detailed in the obituary below. Howland turned once again to the lumbering business; he managed the Birdseye Lumber Company in Colorado's Lake County, and the town of Howland was named after him. The town of Howland, located a few miles northeast of Leadville, never grew beyond being a stop on the Blue River Branch of the Denver and Rio Grande Railroad. In 1881, Howland gave up his Colorado dreams and returned to Chicago. He became a traveling representative for a trade journal of the shoe and leather industry. A brief dispatch in yesterday's TRIBUNE announced the death of Col. Henry Howland by accidental drowning in the canal at Rochester, N. Y. Private telegrams received here by his wife and brother at a late hour Sunday night confirmed the sad intelligence, but no further particulars of the accident have been yet received. Col. Howland is a brother of Mr. George Howland Superintendent of the City Public Schools, and a son-in-law of Mr. John Gray, of Grayland. His wife is at present stopping with her father, Mr. Gray. He was born in Conway, Mass., March 29, 1827, received a good public-school and academical education, and in the earlier years of his manhood learned the trade of a practical carpenter. In 1854 he came to Chicago in company with a Boston gentleman and began work in the lumber trade as this gentleman's assistant. Shortly afterwards he went into the lumber business on his own account and continued in it with much success until the breaking out of the war, when he joined the Fifty-first Regiment as Quartermaster, under the command of Col. Bradley. At the close of the war he held the post of Quartermaster of the Department in Kentucky under Gen. Palmer. For some time after his return to Chicago he worked as an assistant in the lumber business, and afterwards went to Leadville, Colo., and engaged in mining operations. Here he formed a partnership with three others in an extensive mining scheme which promised much success, but which was afterwards knocked on the head by one of the partners decamping with the funds, leaving the other three almost penniless. This failure affected him seriously, tendering him unfit for business, and to it may be attributed the unsteady habits which marked the last two years of his life. He left Leadville some two years ago and since then has not been permanently engaged at any business though working occasionally for some firms in the city for the last two months he had been employed as a traveling agent for a Chicago commercial agency, and was at Rochester on business for his employers at the time of his death. He was married to Mr Gray's daughter in 1856. The issue of the marriage being two sons and a daughter. One of the sons is married and has been settled in Leadville for some years past, the other is at Amherst College, Mass., and the young lady is a public-school teacher in this city. For the last few years Mrs. Howland has lived with her father in compliance with the latter's urgent request and because of Mr. Howland's unsettled habits, but there had been no formal separation nor even disagreement between them. Mr. Howland was noticed for his fine business capacity in early years. He was well known to all the old residents of the city and was exceedingly popular among those with whom he associated. A number of relations of the family live in Rochester, who will make the necessary arrangements for embalming the body and forwarding it to Chicago. The burial services will take place at Rosehill Cemetery tomorrow, but the hour has not been fixed, as the exact time of the arrival of the remains is not yet known. Rochester, N. Y., May 7.—[Special. ]—About 10 o'clock yesterday forenoon a boy while crossing the Rochester &	Pittsburg draw bridge at the Ohio basin—a slip of the Erie Canal—saw the body of a man in the water and called Robert S. Multen and Frank Smith, who drew the remains to the bank. Coroner Jones was notified and had the body taken to Hoffman's undertaking room. From letters found in his pocket it was ascertained that the man's name was Howland, of Graylands, Ill., and that he had been traveling for the "National Blue Book" of the shoe and leather trade of Chicago The body had evidently been in the water but a short time. The deceased was of fine appearance and apparently about 55 years of age. On his person were found several letters from his wife and from his son, who is a student in Amherst College, also a number from an intimate friend in Cincinnati, all addressed to Col. Henry Howland. It was ascertained that Howland came to this city April 26, from Buffalo, and registered at the Whitcomb House. He remained there until the following Saturday morning, when he paid his bill, stating that he was going to the house of a friend. He, however, returned almost daily to the hotel for his mail, receiving the last letter Tuesday. Thursday evening he called again at the hotel and said he had no money, but was given a room for the night. Saturday night he was seen in several places on West Main street and West avenue by Officer Burns, who followed him beyond the City Hospital, having noticed his peculiar actions. It is believed that he attempted to cross the bridge mentioned but made a misstep and fell, striking his head against the pier, a gash being found on his head. March 21—"Eliza came to see me today and we enjoyed a pleasant visit together, and I commence to labor for home, happiness, and Heaven." March 29—"Today completes my 56th birthday." From relatives in this city ts is learned that Col. Howland was highly connected, having two brothers in Chicago—Walter, a lawyer at No. 153 La Salle street, and George, who is Superintendent of Public Instruction. A son of the deceased, George, is, as above stated, a student at Amherst College. An inquest was held yesterday afternoon, and a verdict to the effect that the deceased met his death by being accidentally drowned was rendered. Relatives in Chicago have been telegraphed, and will probably arrive in the city today. Photograph, courtesy of the United States Army Military History Institute, Carlisle Barracks, Carlisle, Pennsylvania. Henry Howland Compiled Service Record, Brigade Quartermaster, Records of the Adjutant General's Office, 1780's-1917, Record Group 94, National Archives and Records Administration, Washington, D.C.
John Fitch, Annals of the Army of the Cumberland, Fifth Edition, Philadelphia, J. B. Lippincott & Co., 1864, pp. 135-6. Photograph of Howland's quartermaster's trunk courtesy of Nick Kaup of Northbrook, Illinois. 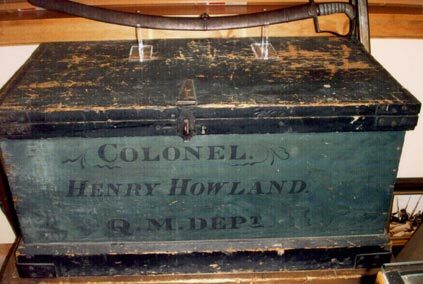 The trunk must be from late in Howland's quartermaster career at regimental, brigade, and division levels when Howland attained a colonel's rank. Luther Bradley Papers, United States Army Military History Institute, Carlisle Barracks, Carlisle, Pennsylvania. 1862 Howland letter, Virginia Polytechnic Institute and State University, Blacksburg, Virginia, Manuscript Collections, Ms91-016. http://www.archive.org/stream/clarkeclarkgenea00john/clarkeclarkgenea00john_djvu.txt (marriage date, children's birthdates).